Refillable trigger bottle for use with the Evans EC7 Green Zone Concentrated Heavy Duty Cleaner and Floor Maintainer. The bottle is printed with details relating to the Evans Vanodine system and comes complete with a robust and versatile, adjustable, plastic spray head. 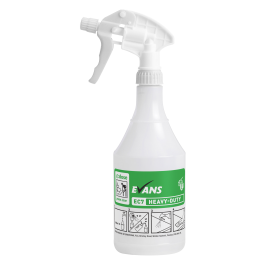 Evans EC7 Green Zone Eco Concentrate is a highly concentrated heavy duty cleaner and floor maintainer. The product has a colour coded formulation and if for the daily and general cleaning of all washable surfaces including vinyl, rubber and concrete. It is suitable for spray cleaning in conjunction with a high speed floor machine or through a scrubber dryer. To be used with the Evans EC7 Green Zone Concentrated Heavy Duty Cleaner and Floor Maintainer system.